What a beautiful Holy Week meditation! 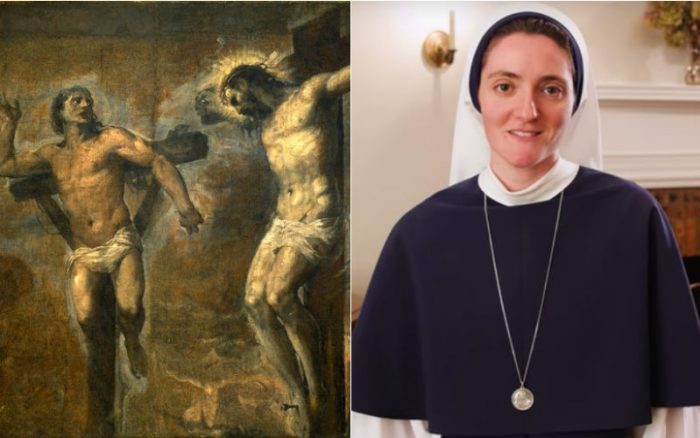 In Redeemed Online’s Lent Series, Sr. Faustina Maria Pia, SV, of the Sisters of Life invites us to model the Good Thief’s “holy boldness” when he asked Jesus “to remember him” at the crucifixion. Click here if you cannot see the video above. “There was something bold and playful, pleading in that response: ‘Don’t forget about me! Miss me! I want to be with You!’ Something that the Lord couldn’t refuse. “That this would be the path to salvation. “And in the Jewish faith, memory was not reaching back into the distant past to pull something forward. But it was a concept that pervaded the present moment. The whole of my here and now. “The law to remember the Sabbath was what made them live it and make it holy every week. “And then the Passover, which they gathered year after year, celebrating this freedom from slavery from Egypt, was celebrated explicitly, knowing that this remembrance would imbue in each person gathered, that this freedom from slavery was mine too. This was my story as well. “This was a child after his own heart that recognized him. “So in the crosses of our lives, whatever sufferings we face, let’s step into that holy boldness of that Good Thief– to believe that we have never gone too far to call upon You.